We manufacture Gas Assisted Gas Handles using ourunique facility of gas injection. One of our machineries is attacked with a unitof gas injection. 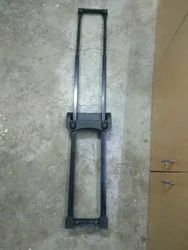 Handles required for luggage companies are manufactured onthis machine. These handles are with hollows inside and give more strength andfeel. Being a well-distinguished company in the market, we are into offering Luggage Handle. This is one of our hottest selling product.